No story exists as an island these days. Books beget movies and vice versa. Sequels, prequels, and tangentially-related storylines are published and consumed. Graphic novels, anime, television series, and videogames flesh out the rest of the universe. This is all market-driven, which is why it isn’t new. But the web and the low barriers to user-created content have sent a small exploded moon’s worth of fictional ephemera* into orbit around popular stories. Alternate realities, fan fiction, 3D worlds, even amateur video series fill in any remaining gaps. Narrative today abhors a vacuum. This is exciting, though it has been mostly theoretical for me. I mean, I know it is out there, but I rarely encounter it. As with so many things, it takes the perspective of a child to really make clear how powerful an idea can be. My six-year-old son is a huge Star Wars junky. He can’t get enough. He’s seen all six movies, both Clone Wars animated series, has dozens of books, has thoroughly mastered LEGO Star Wars I and II, and consumes any other info he comes across. Wookieepedia has changed his life. Here’s the thing. My son knows that Star Wars isn’t real. He really does. But he also believes that it is a complete fictional universe. The movies? Oh, well, they’re good, but in his opinion they are just slivers of the stories in this galaxy (from A Long Time Ago) that someone happened to film. The movies don’t have any real precedence over detailed articles in Wookieepedia about, say, the massacre at The Battle of Rodia, the fallible Jedi Set Harth, or the renowned Sullustan journalist Den Dhur. No, I hadn’t heard of any of these either. Clearly there are limits to this sense of completeness. My son will ask a question about a planetoid or something that none of the games, videos, or wikis can answer. But in his mind it isn’t that the fact or storyline doesn’t exist. It is that it has not been found yet. And isn’t this how we think in the age of The Google? That wanting to know something is more a matter of locating it than wondering whether it exists to be known? 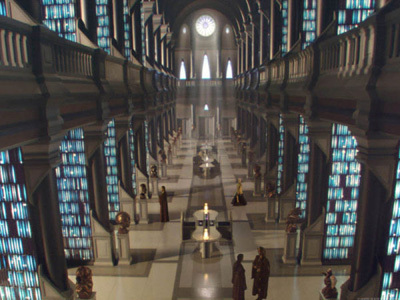 The Star Wars universe is Borges’ Library of Babel and my son is lost in the stacks. Happily so. Of course, you’ll argue, the best fiction deliberately leaves things out, opens a space for the imagination. One could no more know everything about a given fictional world than one could know everything about real life. Well, I think of Lost. The world of that island is meticulously crafted; half of every show is backstory. But obviously there are massive gaps in the storyline. This annoys lots of viewers, but it is also what keeps people coming back and, of course, is precisely what enables the universe to expand, whether by ABC scriptwriters (alternate reality game, “official” in-world websites) or by fans (an archive of over 3500 fan-created videos, a dedicated wiki ). Soon I’m sure my son will arrive at where the sidewalk ends. Some Star Wars story path he’s on will hit a dead end. He’ll confront an incomplete world and will be required to suspend a new kind of disbelief. But if he’s anything like me this will also be the moment when he realizes that creating is even more fun than finding. [*] Odin Soli has called these overlapping stories “fictional ecospheres.” I like that. Great post John, I’m scared to show my son this site.